Shocks fall to 1-4 on the season losing at Houston 4-1. "The effort and energy are there, we just simply need to play better in big moments. We lost a bunch of close sets and need to have a little better plan and identity as far as what we want to do in those moments". Fatima Bizhukova still on the shelf apparently. Combined with trying to replace Gabriela Porubin and Giulia Guidetti and the Shocks are struggling a bit so far this Spring. Shockers knocked of Lousville (4-1), Nebraska (4-1) and Creighton (4-1) this weekend in Lincoln. As a result 10th year Shocker head coach Colin Foster becomes the all-time leader in women's tennis wins as the head coach at Wichita State. Foster has compiled an impressive 179-75 record in his 10 years as head coach. A Purdue graduate and three-year assistant at TCU, Foster passed Les Stafford (178-143, 16 seasons) for most wins in the history of women's tennis. Foster claimed eight MVC Regular Season Titles, eight MVC Tournament Titles and has reached the NCAA Team Championships nine-straight years. HEAD COACH COLIN FOSTER ON..
"It's a testament to all the quality players, but more importantly to me- the quality people we've been able to coach. Also, to have an administration that supports us and believes in what we're doing and to be able to do this with my wife, Kewa, makes this such a special and fun place to coach and hopefully we have many more wins to come." Fatima Bizhukova continues to be missing from the lineup. Although I have not seen or heard what her situation is. The Shockers (5-4) will take on No. 39 SMU on Friday at 11 a.m. followed by Cincinnati at 9 a.m. on Sunday at the Wichita Country Club. Sundays match will be sponsored by Dr. Matthew Conrad, with free donuts and bagels available throughout the match. 1972Shocker, when you going to use ShockerNet credentials to get the story on Fatima? I have Shockernet credentials? I assumed the minute you mention Shockernet doors will close quickly. I guess someone could head out to the WCC Sunday morning for the Cincy match at 9:00 and see what they might be able to divine. Worse case is you get some free donuts and bagels. Last edited by 1972Shocker; February 22nd, 2019, 08:01 PM. I thought you'd get a kick out of that. The Shocks traveled up the road to #37 K-State on Thursday and pretty much were dominated by the Wildcats getting whitewashed 7-0. I'm beginning to wonder if we have the same situation with Fatima Bizhukova as the softball team has with Bailey Lange. Losing their best player to a season ending injury maybe? Fatima has missed the 1st 12 dual matches of the spring season with only 10 remaining before the AAC Championships. The Shocks fell 0-4 to #8 Oklahoma State on Sunday at the Wichita Country Club. Generally, OSU dominated this match but there were a couple of interesting things. The most interesting and perhaps most promising thing for the Shocks was that their best player, Fatima Bizhukova was in action for the first time 13 matches in to the spring season. Fatima and Marta Bellucco who were ranked #46 in doubles coming into the season did not finish their match with the #21 ranked OSU team but they were leading 5-3 when OSU clinched the doubles point. In singles play Fatima played in the #1 slot against #26 ranked Katarina (Arturo) Stresnakova. Again that match went unfinished tied at 1 set each (0-6, 6-2) when OSU clinched the match. The Shockers forfeited the #6 singles. I noticed our that senior Sandra Honigova, perhaps our 2nd best player did not play in this match. Could have been a last second injury or perhaps illness hit. In any case, great to have Fatima back. Hope she can stay healthy. She can make a big difference for the Shocks. Last edited by 1972Shocker; March 12th, 2019, 02:38 PM. The Shockers returned to the courts today to take on #39 Gonzaga and came a way with an impressive 6-1 win over the Lady Zags. Both Fatima and Sandra were back in action for the Shocks. Gonzaga's #26 ranked doubles team took down the Shockers #46 doubles team of Fatima and Marta in a tiebreaker losing the tiebreaker 8-6. However, the Shocker duo of Ting-Ya Hsu and Lingwei Kong had already secured the #3 doubles with a 6-2 win. In the #2 doubles Sarvinoz Saidheujaeva and Esther Thebault battled to a tiebreaker and then clinched the doubles point with an 8-6 win in the tiebreaker to turn the tables on Gonzaga and give the Shocks the doubles point. In a bit of an unusual circumstance the order of finish in the singles matches was 1, 2. 3, 4, 5, 6. In the No. 1 singles Fatima took on the 7th ranked singles player in the country and won in impressive fashion 6-2 and 6-3. Sandra returned to action and was sharp as well taking the #2 singles 6-4, 6-4. Esther pulled out a 3rd set tiebreaker victory in #3 singles. Sarvinoz fell in the #4 singles in 3 sets, Lingwei won the #5 singles with a 10-8 win in tiebreaker in lieu of a standard set. Ting-Ya won the #6 singles 6-2 and 7-6 winning the tiebreaker by an 11-9 score. FROM HEAD COACH COLIN FOSTER ON..
"The doubles point really could have gone either way. I thought both teams did a great job of competing and fighting. It wasn't always pretty points, but just fighting. It could have gone either way, but obviously that is a huge point to get on the board against a good team.Ting-Ya (Hsu) and LingWei (Kong) have struggled a little bit the last couple times out in doubles. They put in a little extra work this morning and I think it showed with a convincing win. Then we were able to get one more across the line for the doubles point." "In singles, we expected a fight from them. We came out and got leads- up a set in all four courts in here. They didn't back down, and we knew they wouldn't. They put us under some pressure on all the courts, and we did well to just handle that pressure. Esther (Thebault) finding a way to win after having a whole bunch of match points earlier in the third set shows a lot of maturity on her part. Then of course Fatya (Bizhukova) - it's great to have her back in the lineup and shes proven over and over in her career that shes capable of wins like today. Really good result and performance from here, but not surprising from my end." Hopefully, everyone can stay healthy now an it will be interesting to see what the Ladies can do at full strength. Last edited by 1972Shocker; March 12th, 2019, 02:41 PM. The Lady Shocks traveled to Florida this weekend for a couple of matches against fellow AAC members. The Shocks took in USF today in Tampa and fell by a score of 4-1. Of interest in this match is that Fatima Bizhukova played in the doubles portion of the match but did not participated in singles play. "We've found a way to win some of those close doubles points this year, today it just wasn't meant to be in that area. In singles, we fought hard but in the end they were just good. Sarvinoz (Saidhujaeva) continues to play with a lot of confidence, belief, and energy. I thought on the other courts USF brough that energy and belief to the big points just a bit more than us and fed off of being at home. In the end, they just outplayed us and deserved the win." The Shocks jump out of the frying pan into the fire on Sunday in Orlando when they take on #26 UCF at 11:00 am CDT. The Shocks fell to #28 UCF 4-0 who won the doubles point and then dominated the Shocks in winning the #3, #4 and #5 singles matches. Fatima was back in both the doubles and singles lineup although didn't do the Shocks much good today. The Wichita State women's team got back in the win column Saturday, knocking off North Texas 4-2 at the Crestview Country Club. 10th YEAR HEAD COACH COLIN FOSTER ON..
"We came out with great energy in the singles. Fatya (Bizhukova) just played a really focused, composed match right from the start and set the tone for the whole team. Esther (Thebault) and Sarvi (Saidhujaeva) were in some tight first sets and just toughed it out and then got a little bit of momentum and were able to close it out in straight sets. "It was a disappointing doubles point, we've got to kind of get back to the drawing board in doubles a little bit. We were so efficient at the start of the year in that area, and it has taken a step back. We'll address it and get better. It was really good to see us put that behind us in the singles and get right down to business. Certainly the doubles is an area that we are going to have to take a look at and we've got work to do in everyone's game and to finish the season strong and accomplish some things we want to accomplish. We've got some work to do but we know we've got the motivation to do it in the practice and the opportunities to do it in the matches with what remains in our schedule." ---Ting-Ya (Hsu) and Alexandra (Lazarova's) strong play in flights five and six.
" Having to wait to begin their matches, it is always a tough situation but it is the same for both players. They both came out and got down to business and got themselves up a set and put a lot of scoreboard pressure on the other side. Alex (Lazarova) did well to close it out and Tina (Hsu) has been playing at a high level even though she didn't get to finish her match today. She's been working hard and playing well." The Lady Shocks have not trouble dispatching UMKC 4-0 and Drake 7-0 on Saturday. Things will be much tougher next Saturday as the Shocks host Oklahoma. The Wichita State women's tennis team dropped a hard-fought battle to #31 Oklahoma, 4-3, Saturday at the Sheldon Coleman Tennis Complex. The Shockers (11-9) rallied from a 3-1 deficit to tie the match at three, before falling to the Sooners. "It was definitely an abnormal match in the sense that five of the six singles were very fast. Kudos to Esther (Thebualt), Alexandra (Lazarova), Ting-Ya (Hsu) – they should take a lot of positives from today's result. Unfortunately, we just couldn't find one more point out there." OU won the doubles point winning 6-2 at the #1 doubles and 6-1 at the #2 doubles. The only singles match that was somewhat competitive was #1 singles which went 3 sets. All 5 of the other singles matches were 2-set sweeps and every set in those matches was either a 6-1 or 6-2 score. As Coach Foster said that is quite unusual. OU won the #2 and #4 singles while the Shocks won the #3, #5 and #6 singles with the match coming down to the #1 singles. That match went to OU 3-6, 6-2, 6-2. Quite the battle going on at the Coleman Tennis Center (?) this afternoon between the Shocks and Tulsa. Tulsa bounced back to win the #1 and #2 singles fairly comfortably to take a 2-1 lead. The Shocks countered with straight set wins at #5 and #6 to retake the lead at 3-2. Tulsa wins the #3 singles in 3 sets: 6-0, 4-6, 6-4 to tie the match at 3-3 with the outcome pending on the #4 singles. The Shocks win the #4 singles at 6-7, 6-0, 6-0 to win the match 4-3. The Shocks close out there regular season hosting St. Louis on Saturday at 3:00 pm. Some chance of showers tomorrow afternoon. May have to move it indoors. 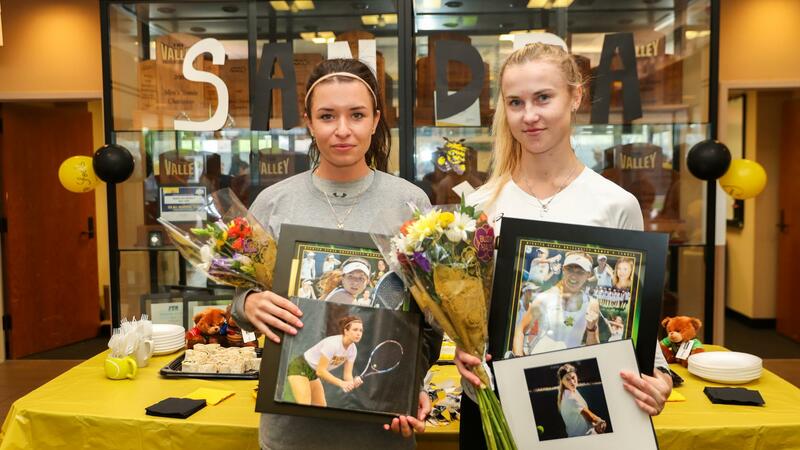 Shockers finish off the regular season with a 7-0 win over St. Louis on Senior Day as Fatima Bizhukova and Sandra Honigova finish up their Shocker careers. I am not quite sure why Fatima is all of a sudden a senior. Her bio shows she was a freshman in 2016-17 and a sophomore in 2017-18 and I am pretty sure she has been listed as a junior most of this year. It's possible she is earning her degree in 3 years, not uncommon especially in the women's sports. But she missed the 1st half of this year due to what Taylor Eldridge reported as eligibility issues. My guess is that she played somewhere overseas before coming to Wichita State that used up a year of her eligibility and earlier this year that had to make sure she had not used up more than that before she could play this year. Or maybe she earned her degree and is moving on. As fans we are left to speculate on these things these days. In any case, a big thank you to Fatima and Sandra for being terrific representatives for Wichita State and very good tennis players. Losing our #1 and #2 singles players will be a challenge to replace next year I wish both of these young Ladies good luck in their future endeavors. The Shocks open play in the AAC Tournament on Wednesday at 9:00 am EDT/8:00 am CDT against #12 seed UConn. The top four seeds, #1 UCF, #2 USF, #3 Houston, and #4 Tulsa, receive a 1st round bye. So this is actually a pretty good slot for the Shocks. They get a tune-up against the bottom seed in the Tournament and, if they can win that match, they get #4 seed on Thursday. This is the 1st meeting ever between the Shocks and the Huskies. The Huskies ended the regular season with a 5-12 record, including a 1-4 mark against conference opponents. Their wins include Quinnipiac, Detroit Mercy, Temple, Georgia Southern and Bryant. The Shocks are 13-9 and played their usual tough schedule. If the Shocks can advance to Thursday they get Tulsa who they just defeated 4-3 in Wichita last Friday in a tough match. That would be a pick-em match-up if it comes about.